Andhra University Distance B.Ed Notification 2018. AU Distance B.Ed Admission Notification, Andhra University AU School of Distance Education, Visakhapatnam, 2-Year B.Ed. Programme through Distance Mode Entrance Test - 2018 : Instructions Booklet. AU has released notification for Distance B.Ed. for 2018-19 through entrance examination. Applications are invited from in-service teachers for admission into 2-year B.Ed (Bachelor of Education) for 2018-19. Details of AU Distance B.Ed are given below. 2 YEAR B.Ed. ADMISSION (DISTANCE MODE) NCTE RECOGNIZED. 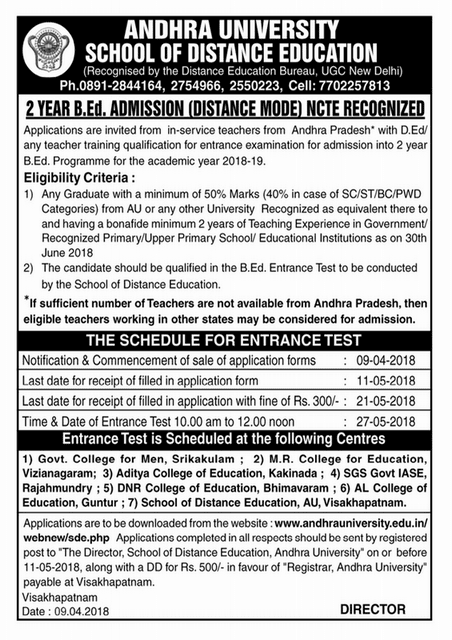 Applications are invited from in-service teachers from Andhra Pradesh with D.Ed/ any teacher training qualification for entrance examination for admission into 2 year B.Ed. Programme for the academic year 2018-19. AU Distance B.Ed Entrance Exam Pattern, Syllabus. Admission into B.Ed. programme, the candidate should have passed any Bachelor's Degree(except BFA/BAOL) with a minimum of 50% marks from Andhra University or any other University recognised as equivalent there to. However, SC / ST / BC / PWD candidates need to possess a minimum of 40% marks as per rules of State Govt. of Andhra Pradesh. The candidate must also be a trained in-service candidate and working in Government Recognized Schools or working in Educational Sector as primary, upper-primary teachers with SGT/ PRT/ TTC / D.Ed. / D.El.Ed. / D.P.Ed. / Pre-primary / Montessori / Fine Arts / any course in Education approved by University / NCTE. Last date for receipt of filled in application form :11-05-2018 upto 5-00 p.m. Candidates can also download the application form from our website www.andhrauniversity.edu.in/sde. However they have to pay 500/- by way of DD drawn in favor of Registrar, A.U. towards cost of application form and submit the same along with the application. 5. Two Self-Addressed envelopes of 11'' X 5'' size.